Isiah Was a Prophet: What did you expect? I don't think you like Josh Smith. 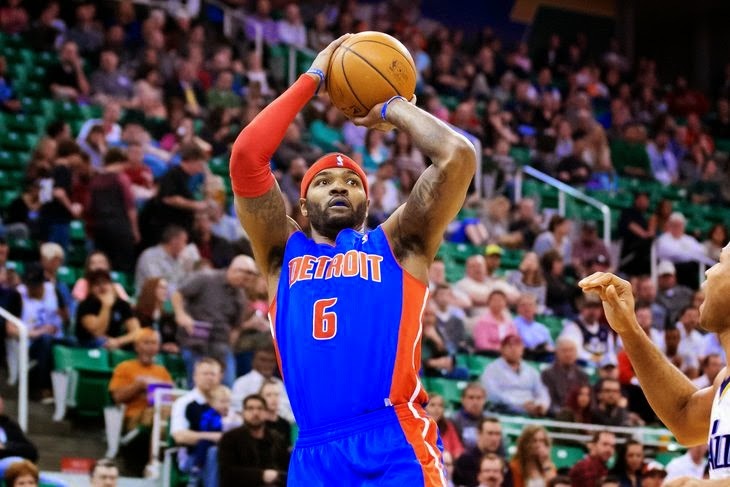 Most people who read Detroit Pistons blogs do not like Josh Smith. And it's difficult to blame them. For his career, Smith has been a complicated, everyman power forward. This year, you can add "mostly incompetent" to that string of adjectives. The Pistons have been unexpectedly bad this season. Stan Van Gundy was supposed to save the team, and though a string of injuries has thrown the roster into question and Andre Drummond has looked like a shell of his former self, this Pistons team appears broken in my systematic ways. Much of this is being dumped on Josh Smith. It's probably Stan Van Gundy's fault. What did we honestly expect when it was announced that SVG was going to start a frontcourt of Smith, Drummond, and Greg Monroe? Barring unforeseen improvement in his jump shot, the problems that plagued Smith last season were bound to return. Van Gundy does not have the panacea for a lineup with three players who probably shouldn't venture outside of 10 feet from the hoop. And trying to cram the three of them in the paint together is ripe for high comedy (see: last year). 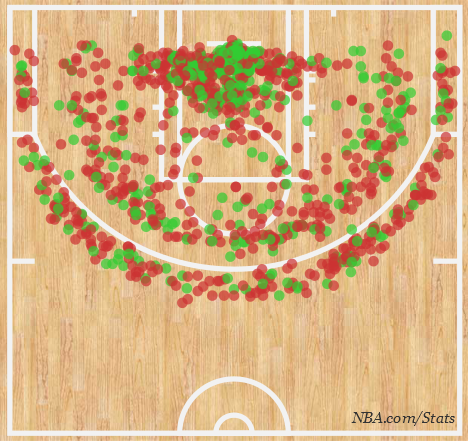 Smith has been criticized once again for taking too many long jumpers, but take a look at his '14-'15 shot chart (right). Smith has taken only 20 three pointers through the first 11 games this season. His long 2s have even been reduced: he is taking 57.7% of his shots from inside of 10 feet according to NBA.com. And yet he's shooting only 42.6% from inside 10 feet this season. Smith isn't entirely at fault for this awful shooting percentage. This season, Smith averages 5.3 FGA within 5 feet of the basket, and hits 50% of them. The only small forwards with more attempts within 5 feet of the basket than Smith this season are Tyreke Evans (9.6 FGA), Lebron James (8.2), Tobias Harris (6.9), and Giannis Antetokounmpo (5.4); Jimmy Butler is tied with Smith at 5.3 FGA. You may notice something with all of these players, with the exception of Lebron whose status as a small forward is questionable: all of them play with a big man who can reliably step away from the paint. Anthony Davis, Channing Frye, Ersan Ilyasova/Jabari Parker, and Pau Gasol are all players that can step away from the hoop and command respect from the defense. Meanwhile, between 5-9 feet from the basket, only Joe Johnson averages as many FGA as Smith does amongst small forwards and power forwards (3.5). Smith is shooting a putrid 30.8%, incidentally the same shot percentage as Greg Monroe, who averages 2.9 FGA from that range (good for the 4th most attempts amongst forwards). The point is this: despite changing his shot distribution for the better (last season, he took 55.5% of his shots from the free throw line in; this season he's taking 62.5%, in addition to significantly less three pointers), Smith is still struggling largely because it's difficult for small forwards to operate around the basket, especially with two traditional bigs. When Smith posts up, something that has become a staple of the Van Gundy offense, he's often surrounded by opposing bigs who aren't pulled away from the rim by Monroe or Drummond. The counter argument here is that Smith isn't exclusively on the floor with Monroe and Drummond. The three have started the season together and typically close games, with the exception of the last two or three when Drummond has been benched in crunch time. However, Smith's shooting percentage by quarter reflects this: 37.9%, 37.5%, 41.5%, and 27.6% respectively. Those could be rose-colored glasses though. It's entirely possible that Smith is in the not-so-glamorous twilight of his career and doesn't have the legs to start or finish strong. (The reality probably falls somewhere between these ideas.) However, Smith looks more aggressive than ever, attacking the basket and using his athleticism to create for others. The real secret is that the Pistons are actually not shooting terribly from outside this season. Pistons get 26.4% of points from 3, 6th in NBA. And their best 3-point shooter (Meeks) has yet to play. Last year, 27th in that category. 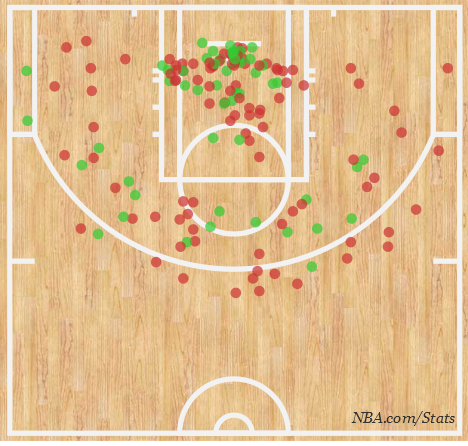 While they're not shooting the lights out, that shot chart shows that the Pistons are hovering somewhere around league average in most outside zones. The problems that the team encounters are somewhere inside. So yeah, it's the spacing issue again. I drive the Kentavious Caldwell-Pope bandwagon. And while he's been (generously called) inconsistent this season, his numbers are actually a lot more positive when you do a little digging. If you excise the first three games of the regular season, when KCP was recovering from a nasty knee strain, he starts looking like a more competent and viable go-to option. In those first three games, KCP shot 2-16 from outside and looked generally moribund on offense. But the follow 8 games, he's shooting 18-44 (40.9%). He still has stinkers too often--0-4 against Memphis, 1-6 against Oklahoma City--but generally speaking, KCP has been a threat from outside. Meanwhile, the rest of the team's outside shooting has been impressive: Brandon Jennings, 47.1%; Caron Butler, 40.5%; Jonas Jerebko, 36.8%; Kyle Singler, 40.6%. 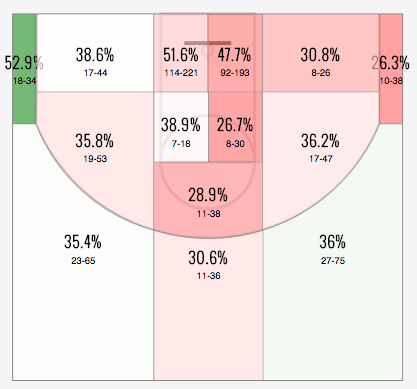 Only DJ Augustin, at 22.6%, has been a consistently poor shooter from the three point line. With the Pistons playing exceptionally slow basketball (they are 25th in pace this season), Stan Van Gundy is generating most of these struggles himself. While issues abound with using Andre Drummond as a constant post player, the real trouble comes by shoehorning Smith into the same role he proved incapable of playing last season. When you watch the Pistons, they do so many things well but eventually fall apart, which typically happens when the opposition starts playing to the Pistons' self-made weaknesses. The issue is that Cartier Martin, Jodie Meeks, Jerebko, or Singler don't project as competent small forwards, a limitation of the Pistons' roster. If the Pistons ever do move toward a more coherent offensive lineup full time, that would require KCP to play small forward, a conceit that would sacrifice size on the defensive end. But at some point, Van Gundy needs to make a change. He's banging his head against a the same wall that Mo Cheeks and John Loyer did. What did he expect to happen?